This is actually from the meal we had for Easter. I decided since we would be staying in to make a more complicated dinner. It ended up being really tasty and everyone was a fan. I will share the chicken recipe soon. 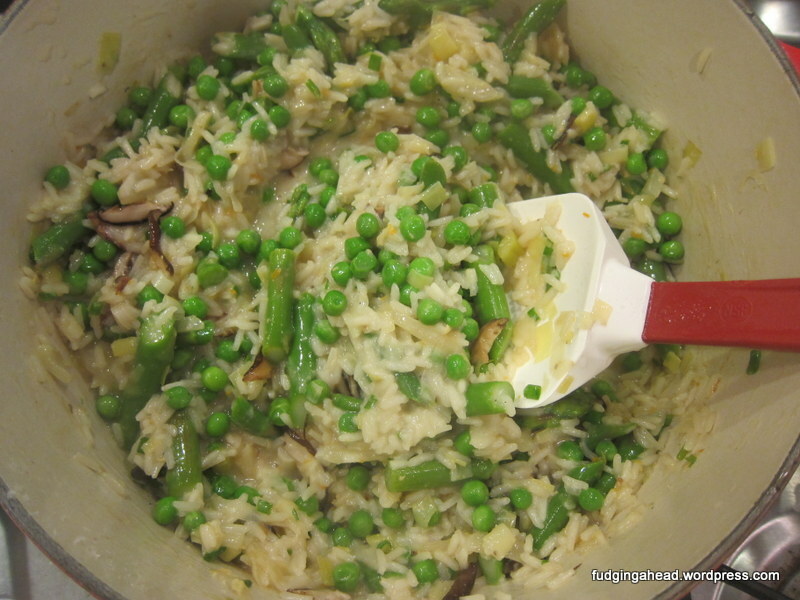 For now, enjoy this risotto with lots of vegetables and warm weather flavors. If you are anxious about the fennel, well, I was, too. I have never cooked with it before, or even bought it before. I was worried it would be a strong flavor that we wouldn’t like, but we all did! On its own I think I would not be a big fan, but in the dish it worked perfectly. As for how to prepare it, read ahead. I like that this dish is both a starchy course and full of our vegetables all in one. The Fudgelet did well picking up the little pieces to feed himself (he still prefers fingers mostly over utensils). Continuing the Italian trend I’ve been on over the last week, here is another yummy dish for you! It comes courtesy of my Lidia’s Italian-American Kitchen cookbook. Well, sort of. She has her own basic risotto recipe, but I like doing my own thing for it. Hers was a bit more involved than my normal risotto. 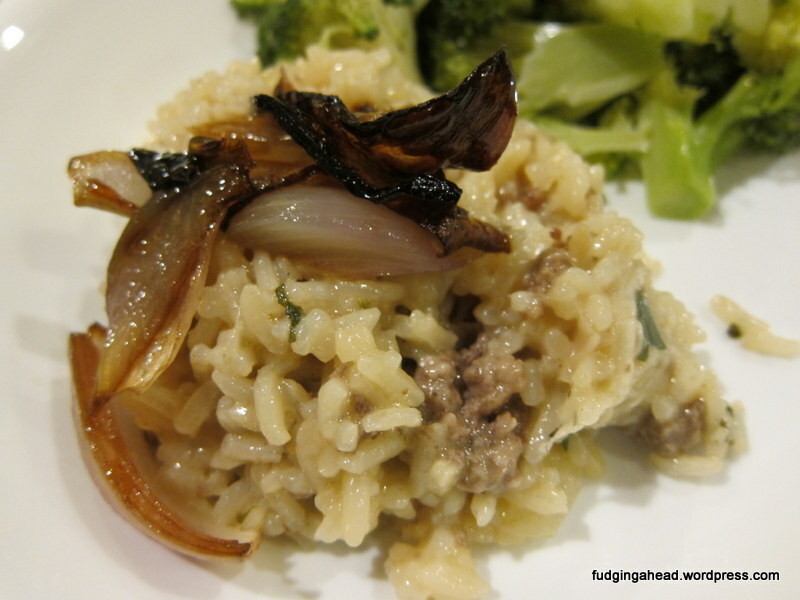 I haven’t shared my risotto recipe on here yet, so below you will find my basic risotto, which is similar to the quinoa risotto I have shared before. 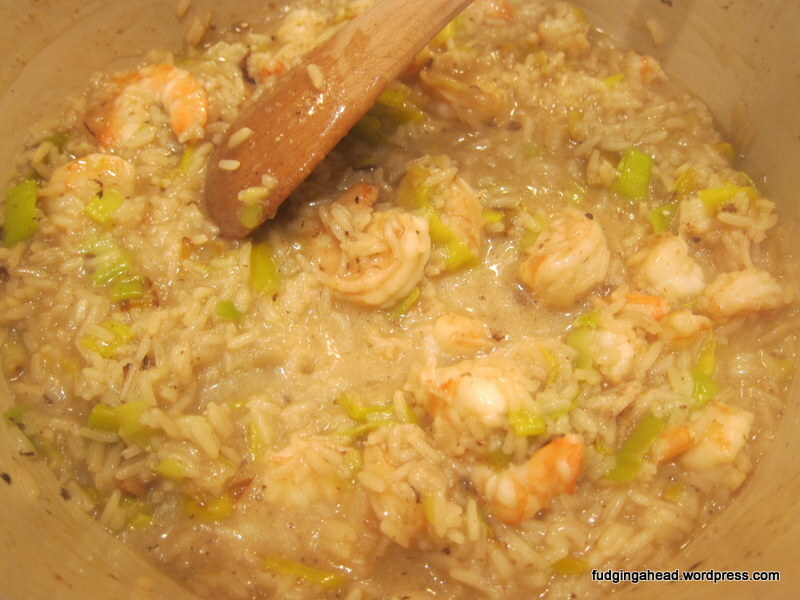 I will include the shrimp and leek variation because it was particularly yummy, but you could easily add other ingredients instead. Chicken, mushrooms, vegetables like broccoli, and other ingredients could be swapped in for your flavor preferences. 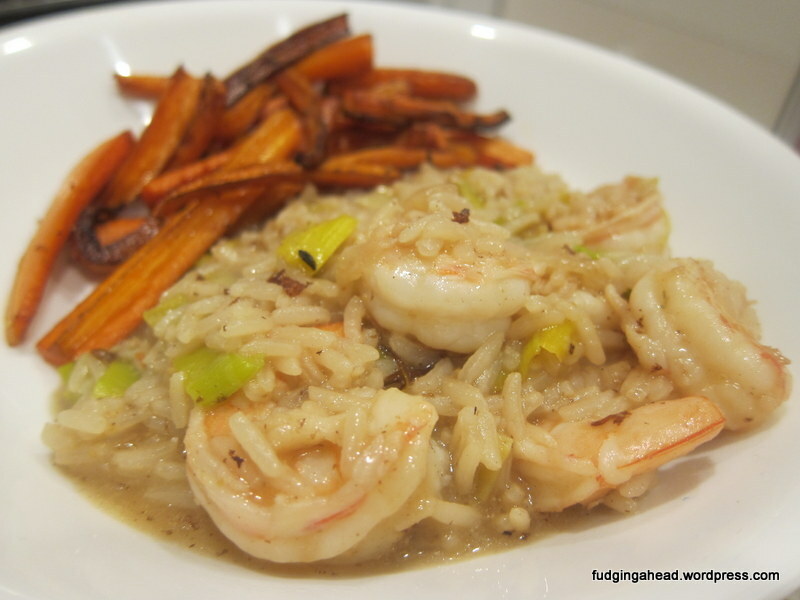 This was one of our Friday Lent meals, and I had a shrimp craving, so here you go! I have been making a version of this dish for a few years now. It makes a bunch of food, so as a single girl I had lots of leftovers. Now, it does not extend quite so far, but you can easily add more meat to make up for all of the sides in this. Because, oh yes, this is a one-dish wonder. 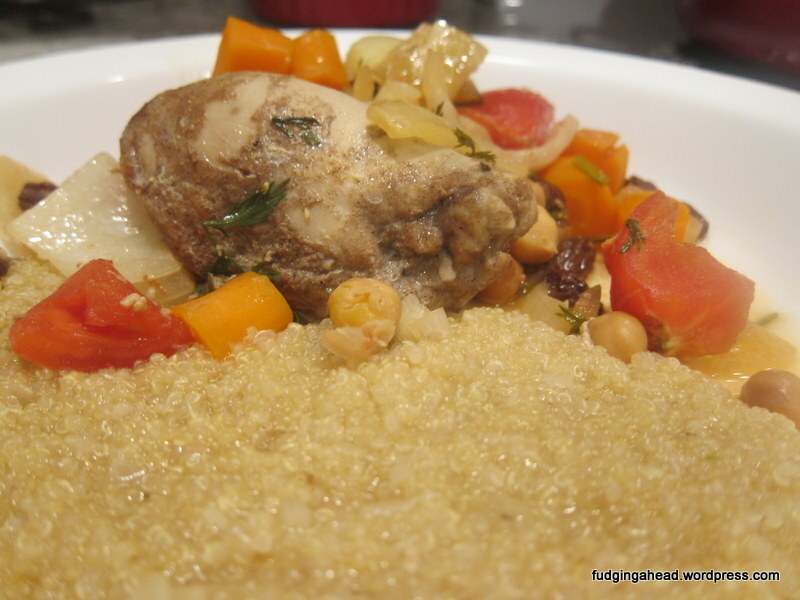 You could leave off the quinoa risotto entirely, or use couscous, OR you could go nuts and add some starchy food into the slow cooker, like potatoes. I think sweet potatoes would go really nicely in it. Originally, this dish was modified from a Good Housekeeping issue (September 2007), but my husband decided recently that he is not a big fan of butternut squash (the main star of the dish before). So, I opted to turn it into a carrot dish. There is a bit more liquid, so you could either use less chicken broth or use a butternut squash (about 1.5 pounds) instead of the carrots.